Turn ordinary dinner rolls into delectable post-Thanksgiving sliders with the help of a few simple ingredients and a Panini press. For this recipe, we used leftover homemade cherrywood smoked turkey and our favorite new Thanksgiving fruit relish, Door County cherry chutney with rosemary. Split each dinner roll in half lengthwise. Spread with 1 ½ inch slice of goat cheese (about 1 T) and top with 1 slice turkey breast. Spread about 2 tsp cherry chutney on top of the turkey. Working in batches, grill sliders for 3-4 minutes or until browned, crisp and heated through. 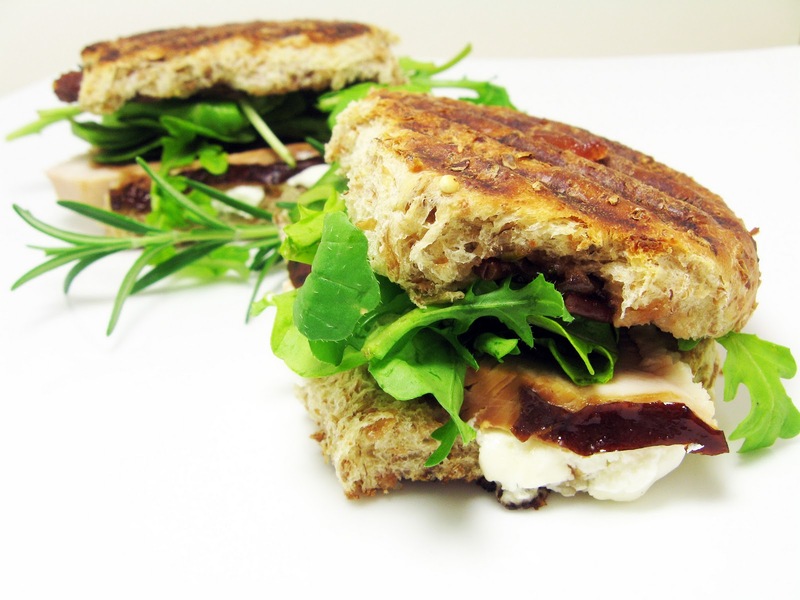 Open each Panini and top with fresh arugula before serving. So simple yet so perfect. This is how I want to enjoy my leftover turkey! Thank you for sharing another inspired recipe with me. I hope you are having a great start to your week. Many blessings this Thanksgiving to you and yours!